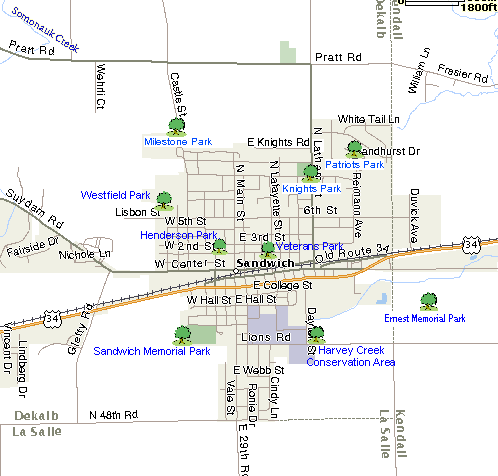 The Ice Rink is 60 feet x 110 feet and is located at Knights Park, 1001 N. Latham Street, Sandwich, IL, 60548. It is open from 8:00am to 9:00pm. As the weather changes the park district will open or close the rink. Watch for the RED flag or the GREEN flag to fly! You can monitor the flags on our ICE RINK page on our website and on our Facebook page. Volunteers are greatly needed and appreciated to shovel the rink when needed and call the office at 815-786-8044 if you would like to be trained to resurface the ice. Hockey hours are 8:00am to 10:00am and 8:00pm to 9:00pm every day. If no one is skating, you may play hockey.